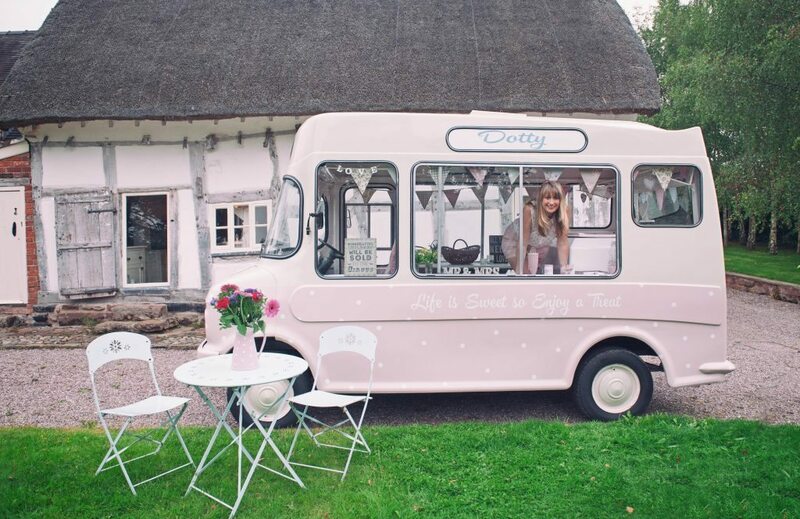 Decked in her finest bunting, pretty flowers and cute vintage trinkets, Dotty is sure to add that something special to your event, serving delicious local Cheshire ice cream and sorbets in the finest quality waffle cones. Choose from 10 luxurious flavors, including Vanilla Pod, Honeycomb, Chocolate, Red Cherry and a gorgeous dairy free Passion Fruit Sorbet. We also serve a selection of retro ice lollies that will transport you back to your childhood days, from Strawberry Splits, Mini Milks and Fabs. Dotty is quite the show off these days too and loves nothing more than to pose for photographs. There will always be an opportunity for unforgettable wedding snaps to be taken with her. Rest assured, we will always go that extra mile to make your event truly special. Dotty loves to attend weddings, parties, corporate functions and many public events such as festivals and local fetes. No event is too big or too small, so please don’t hesitate to contact us. We cover Cheshire, Shropshire and North Wales.